"May Day Song Performance, May Day ca. 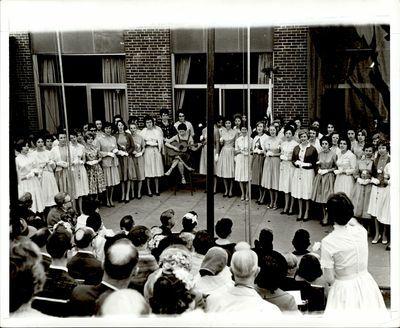 1962"
An audience of formally dressed men and women watch a student choir sing. Each student holds a white flower while crowding around a woman playing the guitar. NOTE: This photograph can be seen in the Lesleyan,1962.